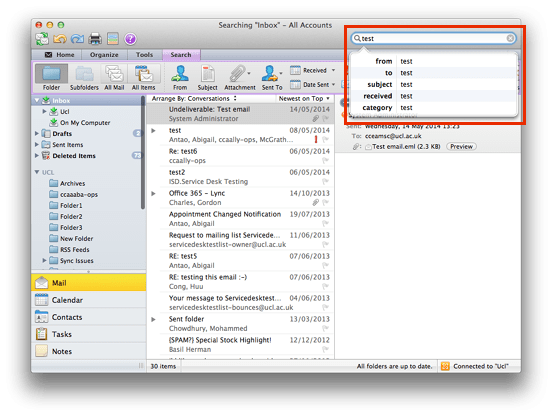 Search not working on Outlook 2011 on your MacBook or iMac? Try this! Recently, a client in Del Mar had an issue searching e-mails in Outlook 2011 on her MacBook Air. She recently purchased the MacBook Air and used Time Machine to transfer all her data, programs and settings to her new laptop. Everything seemed great until she tried searching her emails, like she’d always done. When we arrived, we tested various theories until we discovered that Spotlight (the program that indexes files on your Mac so you can search for them) wasn’t running properly when it came to Outlook. After testing various things, we came to the conclusion that a complete reindex of Spotlight should fix the Outlook searching issue. Essentially, these commands in Terminal are giving proper security permissions to the Office 2011 folder, then clearing and restarting Spotlight search indexing. Once that’s done, give Spotlight an hour or so to finish indexing (perhaps longer if you’re a file packrat like I am) and you should be good to go! Previous Post Back It Up! Flash Drives, External Hard Drives, Mirroring and Offsite Backup Next Post Looks like Cox is down in San Diego!